NOTICE: All properties represented by Seaside Vacations, LLC are individually owned and furnished to the needs of the owner. Owner's personal property must be respected. Seaside Vacations represents the owner(s) of the property(s) in a client/agency relationship. The terms Guest(s) & Tenant(s) are used interchangeably and are defined as the principal party(s) renting a vacation property & those accompanying the principal party. MD Sales (6%) and Worcester County Short Term Rental (4.5%) Tax adds 10.5% to the total charges. VA Sales (5.3%) and Accomack County Short Term Rental (6.0%) Tax adds 11.3% to the total charges. Travel Protection Insurance is available for 6.95% of the total cost of rental. Other optional charges requested such as Equipment Rental or Pet Fees, or Mid Stay Cleans if applicable. INITIAL RESERVATION PAYMENT: Reservations require an initial payment of 35% of the total and is applied toward the entire reservation. Reservations made within 30 days of the arrival date require payment in full. Upon receipt of initial reservation Payment, a Short Term Rental Agreement will be sent to the party on the Reservation. The signed Short Term Rental Agreement must be returned within five days or OC Blue Vacations/Seaside Vacations may terminate the Reservation. Travel Insurance payment is due at time of purchase and is in addition to any deposit amount due. PAYMENT/BALANCE DUE: Final payments are due no later than 30 days prior to arrival (See confirmation for due dates). All funds received are deposited in an interest bearing trust account until disbursement. Interest earned on trust account is paid to OC Blue Vacations, LLC/Seaside Vacations, LLC. ADDITIONAL FEES: Some vacation properties have location-specific registration, pool or amenity fees. 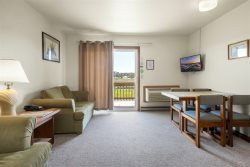 Please refer to the Property-specific information emailed to Guest along with confirmation of Guest's reservation confirmation for more information concerning these fees. Unless otherwise noted in writing, Guest shall be responsible for the payment of any and all fees. Failure to complete the above will result in extra charges plus applicable taxes that will be deducted from the security deposit or billed to Guest. SMOKING PROHIBITED: Smoking is not permitted in any of our rental properties. Violation of this policy will result in additional cleaning charges to return the property to a smoke-free environment. These charges may include, but are not limited to, steam or dry cleaning of all carpeting, area rugs, drapes, bedding, linens, and other furnishings at the discretion of OC Blue Vacations/Seaside Vacations. SECURITY DEPOSIT WAIVER: The majority of our rentals do not require a refundable security deposit. Instead a Security Deposit Waiver fee of $50 is applied to all reservations. The SDW is intended to protect guests from costs incurred due to accidental damages at the leased premises during occupancy. In order to administer claims, OC Blue Vacations/Seaside Vacations must be notified during occupancy and prior to check-out of any accidental damage to be covered. A full description of the SDW is included with each confirmation. SECURITY/DAMAGE DEPOSIT (REFUNDABLE): The Security/Damage deposit is to insure compliance with the Terms of Occupancy. The Security/Damage deposit is held until determination of condition and content of the rental property upon check-out. Security/Damage deposits will be sent within 30 days after departure in the form of a company check or via credit card provided there are no charges pending. Charges are assessed to cover damage, cleaning and unnecessary service calls. Please report any problems or damages observed in the rental property upon check-in. Unreported problems and /or damages are assumed to have occurred during occupancy and guest shall be held responsible for those damages. RESERVATION PROCESSING FEE: All reservations require a non-refundable $70.00 Reservation Processing Fee. CANCELLATIONS: Tenant initiated reservation cancellations must be confirmed in writing by the Tenant to Seaside Vacations. All cancellations will be charged the reservation fee, cancellation penalty of 16%, fees owed to third parties, and all applicable taxes. Upon receipt of written confirmation of the Tenant’s cancellation, Seaside Vacations will attempt to re-rent the premises. If the premises are re-rented for entire term of the agreement at no loss to the owner and Seaside Vacations and the newly booked Tenant's payment has cleared, the canceled Tenant's payments will be refunded less the required fees and taxes. If the premises are not re-rented for the entire term of the agreement, all payments by the Tenant may be forfeited. If you need to cancel your reservation, please notify us in writing (fax, e-mail, or mail). Payments may be covered by CSA Travel Insurance. Reimbursement by CSA is subject to policy terms and conditions. Transfers for the same vacation home for the same rate period require prior approval by Seaside Vacations as well as payment of a transfer fee. All other transfers are considered cancellations. TRAVEL INSURANCE can protect your vacation investment if unforeseen circumstances require you to cancel your trip. CHANGING/TRANSFERRING RESERVATIONS: Any change or transfer of a confirmed reservation within the same property is subject to property owner approval. Changes from one property to another are subject to our cancelation terms & conditions. TRAVEL PROTECTION INSURANCE: To make sure you have a relaxing, worry-free vacation Seaside Vacations offers CSA Travel Insurance to cover numerous events including illness, injury, or death of tenant or a family member; hurricanes; and other defined perils. The charge is 6.95% of the total cost of your rental. A detailed description of coverage will be provided with your reservation confirmation. CSA Travel Insurance charges are shown on the Vacation Rental Agreement. We highly recommend purchase of the insurance so you may be financially reimbursed in the case of a covered event. A flier describing this insurance will be sent with every Vacation Rental Agreement. For more information call CSA at (866) 889-7409. Refer to the "Sun Trip Preserver" travel insurance. TERMINATION OF RENTALS: We reserve the right to refuse rental, not allow check-in, or to terminate occupancy if, in Agent’s opinion, the occupancy may be detrimental to the premises. No refunds will be given if occupancy is not allowed or terminated as a result of rental regulation violation or if the reservation was obtained under false pretenses. PETS: Most Properties do not allow pets due to owner preference or allergy concerns. If pets are allowed, there is a non-refundable pet fee of $100/pet per stay plus tax. No pets are allowed without an Seaside Vacations pet agreement signed in advance of arrival. If pets are allowed, all pets must be kept on rental property. Guests must abide by all local pet regulations and leash laws. Seaside Vacations reserves the right to charge guest's security deposit or bill guest for any pet related damage or cleanup of pet debris upon departure. Guests (including visitors and day guests) who bring pets to non-pet properties will be subject to pet fees, additional cleaning fees and possible removal from the property without refund. METHOD OF PAYMENT: All rates quoted by Seaside Vacations, LLC are amounts payable by cash, check, e-check, or credit card in U.S. funds. Seaside Vacations accepts MasterCard, Visa and Discover cards. CHECK-IN TIME 3:00 P.M. : Check-ins take place directly at the property you have rented after 3:00 P.M. Sorry, early Check-Ins are NOT available. Please schedule arrivals accordingly. Guests shall not proceed to the rental property, including driveways, beaches or docks prior to 3 P.M. Check-In. CHECK-OUT TIME 10 A.M.: Check-Out and vacating the property on the day of departure is 10:00 A.M. Guest will be charged one additional day rental if property is not vacated by Check-Out time. All property keys must be left in the designated spot in the unit, as described in your check-in instructions. There is a $25.00 charge to principal party for lost, missing or keys not returned. Fees for non-returned keys will be charged to guest. TRASH REMOVAL: Guests are responsible to place BAGGED trash in containers for weekly trash removal. Trash must be sealed and bagged in plastic trash bags and left in designated area in supplied containers. Trash not sealed and placed in plastic bags or in designated areas will result in charges to guests. Individual property owners arrange for trash removal services.